(Nanowerk News) Supercapacitors promise recharging of phones and other devices in seconds and minutes as opposed to hours for batteries. But current technologies are not usually flexible, have insufficient capacities, and for many their performance quickly degrades with charging cycles. The research was published in ACS Energy Letters ("Semi-Interpenetrating Polymer Networks for Enhanced Supercapacitor Electrodes"). 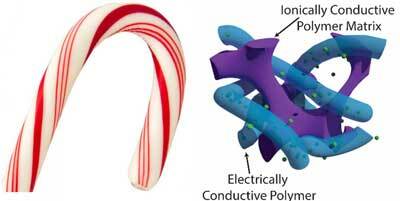 Project leader, Stoyan Smoukov, explained: "Our supercapacitors can store a lot of charge very quickly, because the thin active material (the conductive polymer) is always in contact with a second polymer which contains ions, just like the red thin regions of a candy cane are always in close proximity to the white parts. But this is on a much smaller scale. "This interpenetrating structure enables the material to bend more easily, as well as swell and shrink without cracking, leading to greater longevity. This one method is like killing not just two, but three birds with one stone." This interpenetration technique drastically increases the material's surface area, or more accurately the interfacial area between the different polymer components.